It was another wild year in Canadian sports as the country took another step in the drive to become a powerful sports nation. It has been a long path as Canadians rarely get the credit they deserve for their accomplishments in sports. The country has always been a hockey nation and has always been great at the sport. The accomplishments of hockey players and hockey teams will always dominate the headlines in Canada. It is just the way that Canadians are wired as hockey has been the top sport forever and will never fall below. That was true of 2014 as well with hockey stories taking headlines more often than not. What was different about this year though was that hockey stories did not dominate the entire list. They may have remained some of the top stories of the year but the evolution of Canadian sports continued and more sports entered the conversation for Canadians. The evolution of Canadian sports continued this year as Canada moved further into the international spotlight. It was a year to show that Canada is more than just hockey but that the country is a mix of everything. Although this has been true for many years it hasn’t been seen on an international scale for a very long time. It has only continued the trend for Canadians over the past few years as they have entered the national conversation more and more. It all started in 2010 when Vancouver hosted the Winter Olympics and the world got a glimpse of how much of a sports nation Canada is. Of course hockey was the most popular sport in these Olympics but more than that the world saw a nation that was willing to come out and see their nation’s best athletes compete in any sport. It showed that Canadians were not necessarily the quiet reserved people who most believed Canadians were. It brought Canadian sports into the limelight and from that point on Canadians have seen a bigger role in international sports. It seems like more people are paying attention to any Canadian athlete that has success. Along with that it seems as though Canadian athletes are beginning to catch up to their competition and are starting to compete at the highest level. For so long Canada took a backseat to their competition and despite having some great athletes they never competed. They would be heroes to Canadians but more often than not they were heroes because they participated in big competitions. Now athletes are being cheered because they are among the best in the world as the new standard has been set for Canadians and these Canadians are meeting these standards. 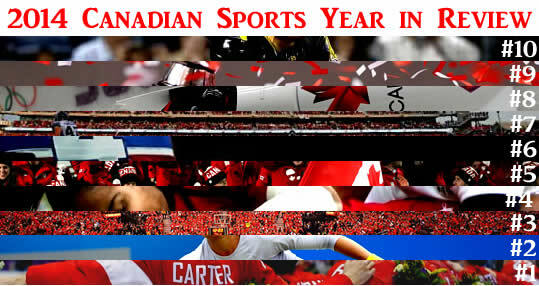 Another year has gone and for Canada it was another step towards becoming a true sports nation. The Toronto Blue Jays are making a habit of being busy in the off-season and this year was no different. As the Blue Jays looked ahead to another year they began to make changes to their team, although not nearly as big as usual. They let a few big names go and signed a number of smaller names but one of the biggest stories of their off-season so far is their Canadian content. The Blue Jays traded away their biggest Canadian player in Brett Lawrie for MLB All-Star Josh Donaldson. It was an upgrade but it was a loss for Canada’s only professional baseball team, as they no longer had an MLB caliber Canadian player and that is where Russell Martin comes in. Martin has been one of the best Canadian players in the MLB for years as a 3-time all-star, Gold Glove winner, and Silver Slugger winner. He has been a valuable member with the Pittsburgh Pirates, Los Angeles dodgers, and New York Yankees. With the Blue Jays, Martin fills a hole that has rarely been filled. Last year Dioner Navarro served as the starting catcher but his lack of offence was a problem that even his good defence couldn’t fix. Now they bring in Martin who has the offensive capabilities and the defensive mind to be a valuable member of the team. More than that it brings in a star Canadian player that grew up in Toronto cheering for the Blue Jays. It is a great addition on and off of the field as he not only is a good player but a player that can bring out Canadian pride in the fan base. It also wasn’t the only Canadian to be brought to the Blue Jays as they also brought in Michael Saunders, an outfielder from Victoria, to inject the Blue Jays with more Canadian. As a new year begins the Blue Jays are continuing to do work and trying to get back to the playoffs after years of missing the mark. If they can they are sure to have an entire country behind them. As the only purely Canadian league the CFL is always making news in Canada that includes the biggest all Canadian spectacle. The 102nd Grey Cup travelled to the West Coast this year as Vancouver played host to the big game. It was a familiar scene for some as a repeat Eastern champion and one of the best teams in recent years. For the Calgary Stampeders it was all about a mantra that they had from the start of the season to finally achieve what they had been trying to do for the last few years. The Stampeders have been one of the best CFL teams year after year but have not been able to win the Grey Cup. They sat at the top of the West Division for years and were often the best in the league but failed to win the big game. They could never finish in the season and so heading into the 2014 season they took that thought and used it to their advantage. The theme was to finish and the Stamps took that to heart as they began their approach to a championship. This year it seemed like everything was going the same for the Stampeders and they were easily the best team in the league. From start to finish they led the league only losing three games all year. With Bo Levi Mitchell at the helm the Stampeders ran through the league and into the playoffs. They were clearly favourites but once again there was doubt over whether or not they could win the Grey Cup. They left no doubt though as they got through the playoffs and into the Grey Cup as the favourites to beat the Hamilton Tiger-Cats. They did just that getting out to an early lead in the 102nd Grey Cup and despite a comeback ended by a penalty they took home the prize. It was the end to a great season for the Stamps as they were the best team from start to finish. The Olympics, as always were a big story this year with the world’s eyes on Sochi as for the Winter Olympics. With the Winter Olympics comes a new set of great Canadian athletes as the Winter Olympics are always where Canadians shine. Four years after a watershed moment in Canada with the 2010 Winter Olympics Canadians were once again glued to the TV to watch the best athletes compete. Before the Olympics even began the Canadian Olympic Committee had a clear path in mind to make sure everyone knew who the stars were heading into the Olympics. One of these athletes was Kaillie Humphries who had risen to be one of the top Canadians in the Vancouver Olympics. At home she won the Gold Medal in the two-women bobsleigh. She was the face of these Olympics and coming into Sochi she had a chance to do something that had never been done. There had never been a repeat champion in the two-women bobsleigh and Humphries, along with teammate Heather Moyse, had a chance to do that and prove that she belongs as the face of Canadian Olympics. With a Gold Medal in the World Championships a year before she seemed to be on the right path as the Olympics started and she drove like she knew it. Eventually she took the gold alongside Moyse and accomplished what nobody had ever done before. The Olympics are just the beginning of her story this year though as her determination to break the gender barriers showed through. Competing in the four-man bobsleigh as the pilot of a mixed team, Humphires came third in the Canadian championship and won a bronze in the North American Cup. Her quest continues through next year as she not only continues to pilot a mixed team but campaigns for the four-women bobsleigh to become an event on the international stage. For all of this she was named Canada’s top athlete with the Lou Marsh Award, a deserving end to a great year for the face of the Olympics who is still a champion and continues to fight to advance women in bobsled. The CFL may not be Canada’s game, that distinction falls to hockey, but it is still a big part of the country’s sports landscape. Although some of the bigger cities may not fully support their teams there are still come crazy fans. The West is full of crazed football fans with the Saskatchewan Roughriders taking the cake on the infatuation with their team. Even in the East where Hamilton showed this year that they love their Tiger-Cats. There are also a set of fans that love their football in North Eastern Ontario but they have not had a team to cheer for in recent years. Those fans are the Ottawa Football fans who lost their team in 2005 when the Ottawa Renegades played their last season. It was the result of a lack of talent on a team that couldn’t win a game that, in turn, resulted in fans not showing up for the game. The Ottawa franchise lost money and the ownership group was not committed enough to keep them running until it got better. The team folded and the nation’s capital was without a team for the second time in the league’s history. 2014 marked a change though as a new ownership group had successfully brought the franchise back and the newly named REDBLACKS made their debut in Ottawa for the new year. The team was no more successful on the field only winning two games all year, but the new was overall positive for the new team. Every home game was sold out in the brand new TD Place Stadium while the ownership group received the Commissioner’s Award. The mood is positive for football in the nation’s capital as the fans are there to support their new team and the ownership group seems ready to stick by their team. It was not only a big year for Ottawa football but it was a big year for the CFL. Their first expansion since the Renegades had gone well and showed that the league is healthy and ready to take another step as they continue to grow and continue to be taken seriously in the grand scheme of things. The NHL has always and will always take focus in the country and they did so again this year although it was not the greatest reason. It was nothing wrong with the league but more the fact that two legendary hockey people were lost. With the NHL so engrained in the hearts and minds of Canadians that these losses hit close to home. The NHL saw two losses this season with the deaths of Pat Quinn and Jean Beliveau. Quinn lost his long battle with an illness that he never released to the public. Quinn was a longtime member of the NHL both on the ice and the on the bench. The longtime Defenceman was a tough man on the blue line but where he made his name was on the bench. He lost his battle with an illness that likely kept him away from the Hockey Hall of Fame ceremony this year. The NHL also lost Beliveau this year after he suffered two strokes that hospitalized him. Beliveau is among the best players of all time and became a folk hero in Montreal where he spent his entire career. The part that connects these two is the fact that both were just generally great men that the NHL loves to see come through their ranks. They had time for anyone and everyone while the fan bases that watched them perform loved them. The “Big Irishman” and “Le Gros Bill” were lost but they also brought the NHL community together. The honours were numerous for Quinn at every place that he touched. With patches and pre-game honours that showed what he meant to all of those places. There were constant accounts of his interactions with players and coaches and few had a bad word to say about him. Meanwhile in Quebec the level of mourning reached throughout the province. The viewing was three days of long lines from everyone who may not have met Beliveau but who were all touched by one of the nicest men in the NHL. The losses this year were sad but they also showed the effect that sports and hockey can have on Canadians. As with any Olympic year the biggest games in the world will always take focus in the world of sports. That is even truer when it comes to winter Olympics in Canada as they love their winter sports. Canada is always known as a winter sports nation and every winter Olympics the country stands still to watch their best athletes perform. This year was that much more important for Canadians as it was the first time the country got to see their athletes after the Vancouver Olympics. Those games were a change for Canada as they got to express their love of the country and the athletes who put the flag on their back. The Vancouver games were also the best performance of any Canadian team and gave many hope that Canada was ready to step forward and be a true power in the Olympics. The Sochi Olympics were the chance to see just how far the Canadians had come in their development of winter sports. Despite number of athletes falling just short the performance of team Canada was once again stellar. The team fell one medal short of their goal of 26 overall medals but ended the games in fourth place in total medal count. They also ended the games in third place for gold medals with 11 total. It was a step back from the Vancouver games but it was also expected as the Canadians were away from home where they gained an advantage in the last games. Still it was a good performance and once again the Canadians showed up in the Winter Olympics and did the country proud. As the country continues to develop its place among the worldwide sports standing they continued to play an important role in the Winter Olympics. The Canadians may have not earned as many medals as they did in 2010 but they did keep pace and did not fall too far behind their pace from four years ago. It was an announcement that the Canadians are here to stay and may only get better as the year go on and Team Canada prepares for Korea in 2018. Canada is a country that prides itself on the mix of cultures in what has become known as a cultural mosaic. That is never expressed better in the fact that the amount of sports played in Canada is enormous. With so many cultures in the country there are so many people bringing new sports and developing these sports. The country is still a young and because of that these sports are still developing in the country but one of these sports took a massive step forward this year. Rugby has been in Canada for decades with the basis of the country in Britain where Rugby was created. For years there has been a small following for Rugby and Canada has relatively been good. They have never stepped in among the best in the world though as they continued to develop their style of play. That changed in 2014 when the women’s national team went to France to compete with the best of the best. It was not new for the Canadians to be in the competition but they had rarely finished very high in the World Cup. This year it seemed like it they had a better chance though as the team was looking better than usual. They had a chance to make some noise in the World Cup and took advantage of that opportunity. The Women went at it from the start easily getting through the group stage until they tied the English in a game that truly showed that they were ready to compete with the best in the world. After beating the Irish 40-7 they got another date with the English team for the finals. It was already an accomplishment as the Canadians were going to finish as one of the best teams in the world. They could not get through the English in the finals but the job was done for the women as they truly shocked most people. Finishing as one of the best teams in the world is nothing to be ashamed of and with Magali Harvey playing the superstar the future is bright for the Canadians who now aim for #1 in the world. Much like Rugby, basketball in Canada is a fairly young sport as it is not engrained in the minds of people in Canada. With a professional team though it is further along and after 2014 it is at an entirely new level. In 2013 Canadians watched as Canadians began to take over the NCAA as March Madness featured many Canadian stars. 2014 was no different as March Madness once again featured plenty of Canadians including Andrew Wiggins. Wiggins went on to be the first overall selection in the NBA draft by Cleveland and was later traded to Minnesota. Canadians once again ruled the headlines in the NCAA with one of the can’t-miss prospects playing a significant role. More than the NCAA though was the performance of the one professional basketball team in Canada. What began in 2013 was continued in 2014 and moved into the pro ranks where the entire NBA realized that basketball fans reside in Toronto. The Toronto Raptors were having a typical season at the end of 2013, looking like a good team that might make the playoffs but would have to battle to get there. Then the new year came and a trade of their biggest name began to pay off. After trading Rudy Gay in December 2013 the Raptors were expected to miss the playoffs for another year. Then came an 11-6 January that put the Raptors into the playoff hunt and began a frenzy that swept Toronto and Canada. That great month helped the Raptors into the playoffs but not before the Toronto fans showed the entire NBA that they deserve the title of the greatest fans. Basketball swept the nation during the playoffs and that led to the creation of Jurassic Park. Fans packed the square outside of the Air Canada Centre for every playoff game and every game was sold out. It truly was basketball fever in Toronto and everyone around the league took notice. The Raptors did not last long in the playoffs losing in their first series but the impression was made and Toronto was put on the map as a true basketball city while the rest of Canada continued to develop as a basketball nation. In yet another sport taking precedence over hockey, at least for a little while, Tennis was one of the sports that all Canadians paid attention to this year. While hockey was on a break the summer sport began to take focus and it was all thanks to two people. One had been in the spotlight for a few years as Milos Raonic continued to develop into a true star in the tennis world. He sat among some of the best players on tour even finding his way to the Semi-Final at Wimbledon. As good as Raonic was and as great a torchbearer as he has become for Canadian tennis this year belonged to his counterpart, Eugenie Bouchard. Bouchard was easily one of the biggest stars of the year in Canada as she swept the nation with her skills. It didn’t hurt that Bouchard is also beautiful and a tennis player that plenty of companies wanted to have as their spokeswoman. She never would have been noticed if she didn’t have the ability though and above all that is what made this her year. Seemingly out of nowhere Bouchard made headlines from the start as she began winning. It began mainly in China when she made it to the finals of Wuhan, although she lost that final match. From there she continued to find her way further and further into the tournament. Her breakout finally came at Wimbledon where she moved all the way to the final match in one of the biggest tournaments of the year. She lost the final match to Petra Kvitova but she had officially arrived in one of the best performances by a Canadian in a Grand Slam tournament. She continued on the rest of the majors and the year finishing among the top players in the ITF. Eventually she would win a tournament taking the Nuremberg title and finishing at the #7 spot in the ITF rankings. She is one of the best tennis players that Canada has ever produced and the future is bright for Canadian Tennis with her and Raonic leading the way. The top five stories of 2014 have all been about the development of sports that often take a backseat to Canada’s main sport. As great as all of these stories were they did still take a back seat to the biggest story of the year, Canada is back on top of the hockey world. It is hard to beat hockey in these rankings and when it comes to a Winter Olympics year it becomes that much tougher. The simple fact is that hockey in Canada is the biggest sport in the country and the Olympics are often seen as the true measuring stick of the best country in the world. There is no finish other than gold that Canadians accept in Olympic hockey and that is a load to bear every winter Olympics year. That is even bigger when the Sochi Olympics seem like the last time that professional hockey players from the NHL will ever play in the tournament. With all of that in mind it was no surprise that Canadians were expected gold from the Canadian team. That includes the women who were once again going to battle it out with the Americans for the gold. The Canadian women got the job done and won another gold medal as they set the table for the men to make it a double gold. The men did not disappoint as they took home their second gold in a row and marked the last professional tournament with a win. In the end the Canadians took home two gold medals at the Sochi Olympics and for Canadians that made the Olympics a success. The top story of 2014 will always be a big part of the Canadian sports landscape and for another year hockey played the part. It seems as though all is right with the world for Canadians when they step on to the top of that podium at the Olympics and when both the men and the women take home gold. It was a great year for the Canadians but overall it may have been a different story if Canada was not at the top of the hockey word for another year.